Editors note: This week we welcome a new blogger to the site, Boone Brady. Boone will be writing a weekly blog about the positions leading up to the season for the summer. You can give Boone a follow on Twitter at @b_rad_y. Welcome to the site, Boone! Wyoming’s offensive line is just like a Clint Eastwood movie. The 2014 season proved it. It was the very definition of “The Good, the Bad, and the Ugly.” They paved the way for some of the best running production, particularly from running backs, that we’ve seen in the past 10 years. We also had, by a reasonable margin, the worst pass protection in the Mountain West Conference. All in all, for the first season in Coach Craig Bohl’s system, we had some growing pains, but it will begin to show its fruits this season. Turnover isn’t always a bad thing. 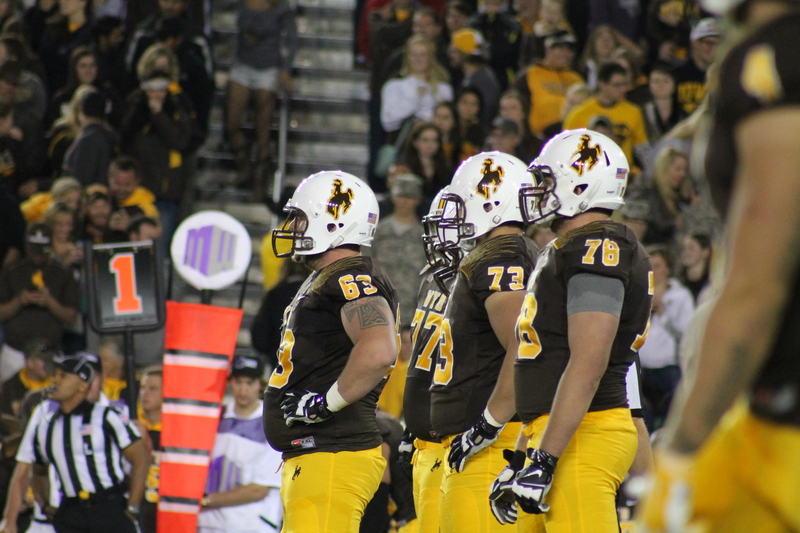 Going into the 2015 season, Wyoming returns only two starters from the end of last season. The offensive line was a huge cause for concern in 2014. They ranked near the bottom of the nation in all pass protection. According to Football Outsiders, Colby Kirkegaard was sacked 6.9% of standard play dropbacks. This only got worse on passing downs, where it shot up to 11% of the time, good for 119th in the nation. We can’t blame the offensive line for this folly entirely. Let’s face it, Kirkegaard makes Corey Bramlet look like Brett Smith with his legs. Having a more mobile quarterback should help, but the pass protection also figures to be better this coming season. As Wyoming tries to improve its pass protection, there’s a couple promising signs. The two returning starters are both on the left side. Ryan Cummings and Chase Roullier, left tackle and left guard, began to work well to protect the blind side last season. New starters Charlie Renfree, Troy Boyland and Taylor Knestis are going to be tasked with being more mauling, brutish type players. As long as they can give Shaun Wick and Brian Hill a sliver of air space, the running game will be fine. It will be particularly interesting to see how Boyland converts to the offensive side of the line. One thing is for sure, if he keeps his tenacity, he’ll be a great addition. Additionally, having Rafe Kiely as a “plug and play” backup is going to help through the arduous schedule we have ahead. This year, Wyoming fans’ patience will begin to pay off. We saw how dominant the running game can be, and given time it will only get better. We have a quarterback with experience at the D1 level, which should allow for some more looks down the field. It will be much easier to protect Cameron Coffman when he’s able to go over the top of the 8 in the box. Let’s just hope our offense can “Hang ‘Em High” and lead us to victory this year.